Time for another update on Mary. She is more or less the same as two weeks ago. Here are a couple of stories worth telling. Mary needs someone at her side almost constantly. She uses her cane. She has a walker but doesn’t like to use it. So we need to walk by her side so that she doesn’t fall. A fall in this point in her life would be deadly. 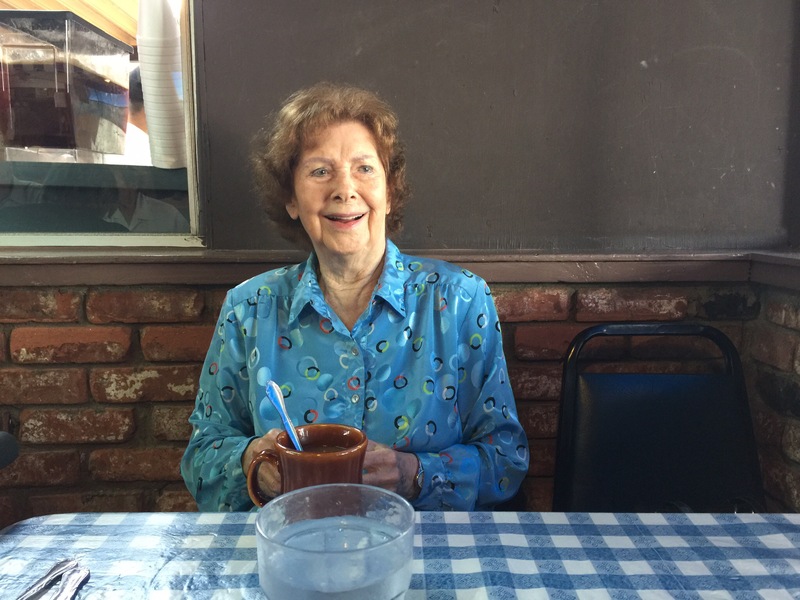 So this week she decided that she would like to attend the monthly luncheon meeting of her Republican Women’s club at the Ports’o’Call restaurant in San Pedro. So this caused us to have some logistical issues. First, neither Paula nor I are members. I fail to meet two of the requirements, that of being a woman and being a republican, Paula passes the first requirement (of being a woman) but not the second. What to do? One time early in our stay here in LA, Paula did go with her but swore to me and to herself, NEVER AGAIN! So that means making alternate arrangements. We call Mary’s friend Beth to see if she can give her a ride home. Paula would take her and leaver her. Beth would make the lunch reservation and bring her home. So far so good. Then on Thursday morning Beth calls me to tell me that she has had to cancel. That means we need to make alternate arrangements. I relayed the information to Paula while she was with Mary getting her hair done at Rose’s Beauty Salon. Paula would go and pick her up at 2:00 PM. We tried to get someone to stay with Mary until Paula picked her up so that she didn’t go wandering off. Paula picked her up on time. Mary had won a door prize which was a bottle of Kahlua with rum. Not sure what we’re going to do it. Mary doesn’t do rum or coffee brandy. Perhaps we’ll donate it to the lodge for pub night. One time a year or so ago, one of her friends asked Mary why Paula didn’t come. So Mary, told the friend that Paula’s husband (that being me) wouldn’t let her. Well Paula just about blew a gasket when the story made its way back to her. She had a word with Mary about making up stories. To which we add, “God Bless President Obama”. Now for the second story. Paula and I try to keep up with what Mary likes to eat and drink. Sometimes the best of plans go awry. First example: Mary has been eating Cheerios with blueberries for a long time. Suddenly she decided that she would like to try something different. We offer her instant oatmeal, nope that’s not it. I usually have some Raisin Bran Crunch. She decides that she’ll try that with blueberries. Well she loves the stuff. Lucky for us Raisin Bran Crunch is on sale at Haggen’s. Next example: For a while now, she has been drinking either cranberry juice or apple juice. She was also drinking Dr Pepper. But we have weaned her off of the sodas. We thought that the caffeine and the sugar couldn’t be doing her any good. Now all of a sudden she wants hot chocolate. (Nestle’s Quik mixed with 2% milk and put in the microwave for 45 seconds. Now we have a couple of gallons of juice that is not getting consumed. She will have to have the juice tonight because we are out of milk and quik. We will push the juice before we restock the Nestle’s Quik. Occasionally people give us suggestions on places to take her. One suggestion was some fashion show in the South Bay. We gently tell people that Mary isn’t the same person that she was five years ago. Going to some of these events takes planning. How accessible is it. Are there enough HP parking spaces? Crazy as it might seem, the store that seems to have the most HP spots is Home Depot. And award for the least number of HP spots go to the grocery stores. We have an HP placard, but a lot of times the HP spaces fill up fast. Evening events are trouble. She gets tired easy and walking in the dark is a big problem. And then after all is said and done, two days later she doesn’t even remember going. We prefer going to known venues that we are comfortable for Mary and us. Church and Lodge fit the bill nicely. There are either ramp and/or elevator. The church has about four HP slots plus a number of spaces for the “elderly”. So we’ll have a quiet night at home and go to church with her tomorrow. I will add a new picture next time I write about Mary. This entry was posted on June 27, 2015 at 7:12 pm and is filed under Aging, Family, Mary. You can subscribe via RSS 2.0 feed to this post's comments.